That special, indescribable bond we have with our critters will be represented in 10 short films at the first Bow Wow Film Festival in Glenwood Springs on Sunday. The festival will be hosted by the Glenwood Springs Center for the Arts, and all proceeds will go to Colorado Animal Rescue (CARE). The Glenwood Springs Center for the Arts is the perfect venue for this film festival, coincidentally. 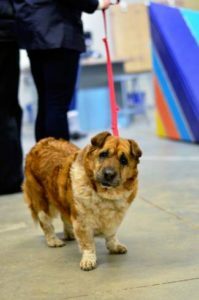 The center had just finalized plans for its “Creative Canines” exhibit, which features art in all mediums focused on man’s best friend, when the Bow Wow Film Festival reached out and asked if the center would host the screening. 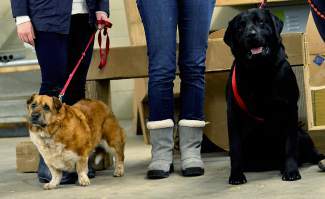 Gladis (left) and Cupid (right) are two dogs from CARE who recently visited Glenwood Springs High School to check out the doghouses that students in the (co)studio design and build advanced class made. In addition to a serendipitous exhibition, CARE was excited to have the screening at the Art Center because the two organizations have worked together in the past, and any kind of collaboration is a good thing, Clark said. The Bow Wow Film Festival is brand new this year and based in Boulder. Susan Kelley, director of the festival, said she reached out to CARE because she knew the shelter had a strong relationship with the community. While the festival takes care of logistics, it relies on the local shelters it’s benefiting to rally the community and make sure tickets sell. Kelley started the festival as a way to raise money for her own shelter close to home. The festival features 10 films, all of which are shorter than 20 minutes, by filmmakers from all over the world. There’s a woman from England, a handful from Colorado, some from the East Coast and beyond. Kelley said she just put the word out about the festival and did some searching, and she found enough great submissions to make Bow Wow happen. The film festival is an ideal fundraiser, Kelley said, because you don’t have to be a current pet-owner to enjoy it. Unlike a dog wash or other pet-centric fundraisers, the film festival offers a family-friendly, fun evening where people can enjoy themselves while supporting an important cause. “It’s just a really great evening to get together, have a lot of laughs and appreciate that bond you have with your critter,” she said.